Just emailed a few people asking them to test out the service and let me know how it goes. @zulusafari – Yeah, I’m interested in some independent 3rd party accounts of this as well. Do let me know when you hear back from them. I’m not unbiased, as Question Box is one of those services, but all these apps show a lot of promise. I’m glad that Google is getting more directly involved in Uganda. They’ve been in stealth mode for like a year. Great to see what they’ve been up to. As an African, albeit one from the so-called Giant of Africa, I am always filled with pride when i read about technological advancements in other parts of the continent. I am an avid reader of this blog, and I thank Hash for all the information he provides. This is an excellent resource. Thanks for all the contributions, this is an exciting technology. Do you have any idea how the partners above plan to market the trading application? Seems like the more buyers and sellers there are the more useful the system. Would you say that their are major obstacles to the adoption of this technology and if so, what are the largest? Thanks. Yes, i have been waiting for this monent for a longtime for Google to be involved directly in Uganda.. What are the charges of the SMS sent for results? Where are the office for Google in Uganda? 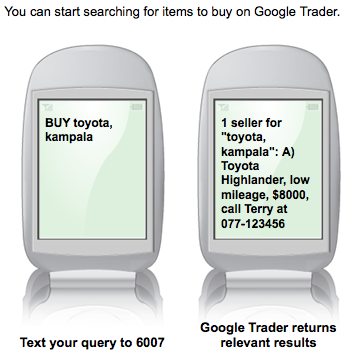 What other useful products has google brought to Uganda? I think there will be a problem with the charge of 220UGX is too much for alocal person.. Hmmmmm? 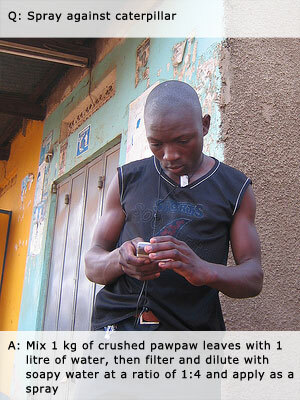 We pay 1000UGX for an hour for internet in a cafe: is really fair to charge 220 for text msg? I think it should be free at first to sell the idea to the people of Uganda. We have some many sms services charging the same fee… Google Please talk to MTN to make free since you gave to them free of charge. Are ther plans to extend this program to Zambia? I want to add my voice to those commending this initiative. It is revolutionary. My major concern is that like with many google led (and indeed most information communication technology led initiatives), more focus is put on the technology and less on the content the technology will enable uses to get. In all their press releases and appearances, they are talking of a technology that quickly avails information as if this information in accurate and readily available-all the time. You tech experts need to seriously think about reliable content generation- and not just developing technologies. Otherwise people are going to be paying (however little) asking for market info only to get info that is a month old or that is inaccurate because it was uploaded by some guy who was just estimating or doing so for individual competition concerns. Some one can for example upload a low price so that others don’t get encouraged to sell at that particular location. However big these people sound (Google, MTN etc) they don’t have the infrastructure nor the interest to collect reliable information especially on ever changing aspects like prices, farming or other technologies etc. We need to encourage these people to see that the technologies are only useful if they enable people to access the information they need -not information that is available. The technologies need to be built with an equal capacity and commitment to information/ content generation…reliable content, accurate and for a particular area. This is where the tech developers need to work with people like journalists and dependable traders etc to help in accurate and consistent content generation. Otherwise, we are stamping our feet for a technology that will deliver outdated or unreliable information, unhelpful information, or one sided information by those with individual interests. There is no guarantee whatsoever that MTN or Google will be able to provide information on Matooke or chicken prices in Paacwa market deep down in Kibaale district…so some one is going to send this sms and what responses does he or she get? prices of markets far off -which prices are going to be outdated (and therefore undependable or bad to depend on). Nor that there will be a variety of vehicle or real estate options (uptodate) for that person seeking information on a car or house to buy or rent. The point is that a technology to share information without a means and commitment to generate this information continuously and accurately is not going to be effective in enabling people to develop- at least for the masses at the grassroots. I live in Jinja and have not seen any adverts about this new arrangement. After loading airtime today, I was greeted by a message alerting me of the new service. I happen to be looking for dairy goats, so I tried it out. I received 8 messages about buying goats (several were the same person/contact number)–none were specific to dairy (This has more to do with not having a dairy goat market, more than failed technology). I called the number, just to see if it was current. The man told me he had only signed up 4 days prior and was surprised to get so many calls! I was not charged anything for the SMS, and the messages I received from MTN were also free. No one said there is a problem with the technology. The technology is working fine. But the content/ information the technology is enabling to get is very lacking. I sent the sms for “where to buy diary goats” and this is the answer i got. “A female goat (she goat) is ready for mating after 7-9 months while a male goat (he goat) takes 12 months. Choose healthy male goat (buck) with two testicles to mate. She goat should be healthy+soft udder to be able to feed the kids.The gestation period is five months. The she goat is able to get pregnant again after 4-5 months. Avoid inbreeding.” This is no doubt good information- but it is not the one i wanted. You can see that the technology is working well and delivering good information but not always information that you need. this gadget will definitely help us as we can listen to our favorite music tracks with its incorporated FM radio. I am recieving some conflicting feeds here. @Ssekazinga says the SMS is expensive. @Bobby Garner said it’s free. Can some one please clarify? Hey Bukola, the service is free for some period of time after when it will cost you 220 UGX for a SMS. do guys view what we reallypost ??? ho efficent is these thing. anybody know if there’s plans to connect this service to others, thinking Twitter specifically. As an aside, how much is Twitter used in places like Uganda, Kenya and Nigeria these days? i thought this thing was specific to ughanda. I typed in “Bin it Ltd” and got bin it uk. Useless info as far as I am concerend. Gerald Businge you have some very insightful contributions. I must say that I agree with you that in Africa we have a “Content Generation” problem. But you must admit that we have a problem not just with creating the necessary content needed by Africans, but also, we are lacking in the required technologies to be able to effect specialized services that will be of benefit to us. This is a bold step that has been taken by Google, MTN and the companies working alongside these “IT Giants”. However, as you have rightly said we need “local content” to make these services effective, and ultimately be put to them to good use. I think for starters that the energies which has been channeled into the development of these IT services also have to be channeled into the development of content. These IT services have to be opened up in such a way that they allow local consumers to be content creators. In addition to this, there has to be at the very least a decent investment in marketing efforts in order to publicize these services, and educate the publics on their use and value propositions. In Africa we are lagging behind not just in technology but also in the culture that drives the creation of content. If these services are to succeed as we hope they will, we need to invest resources not just in the technologies, but in all infrastructures necessary for the creation of the content that drives these services.